Traveling cats spotted on Peck Farm in Watertown, USA. OMD epic win kitties. Have a serene Sunday. Wow, those kitties have won the lottery! Does the health inspector know about this? Lucky cats. All the milk they can drink. Good to have cats on a farm, pest control!!! Du producteur au consommateur ..presque sans intermédiaires. Le rêve ! Those kitties are lucky! Wish I could have some milk. Thanks for visiting my blog! Wow, all the milk you can drink! Nirvana!! 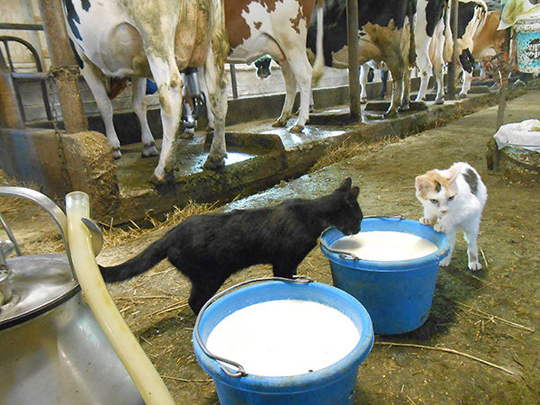 This reminds me of being on the farm with the cats always hanging around at milking time! Cute!